It's the May new moon this week, and the grunion are running. 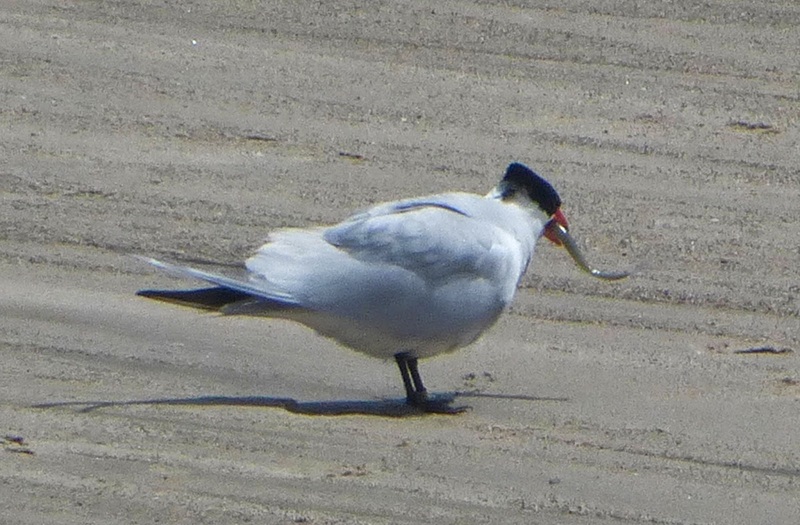 This small silvery fish is off limits to human hunters in April and May, but it's open season for the local shore birds, who, like Gollum, "only wish to catch a fish, so juicy sweet." From March until August, grunion come ashore at night to spawn, taking advantage of the highest full moon and new moon tides to lay their eggs in the sand. The eggs hatch 10 days later, the next high tide carrying the hatchlings back out to sea. When conditions are right, in the dead of night, certain beaches can be covered in living silver as hundreds of fish come ashore, but it's rare to see even one lone grunion during the day. However, the same tides that help the fish reach the sand can strand them. 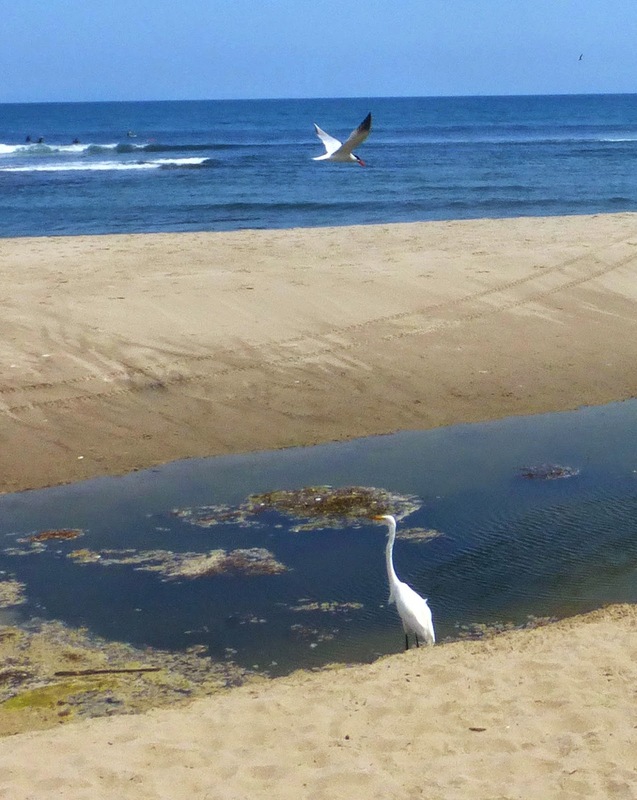 At the Malibu Lagoon, any fish swept over the berm by the tide is fair game for the shorebirds. This season, the lagoon extends in a long, narrow inlet all the way to the bottom of the Adamson House. 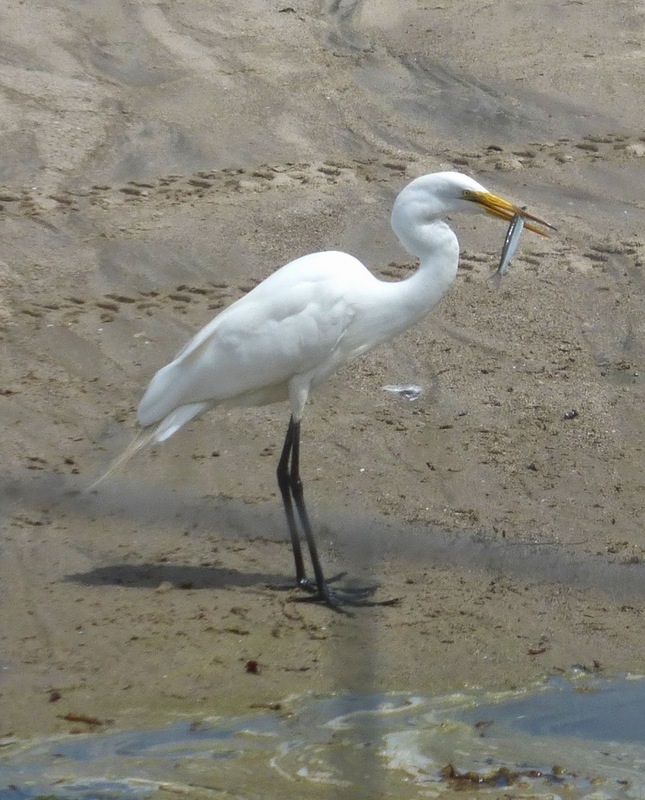 While the water doesn't look appealing to humans, it was a kind of cross between bouillabaisse and a sushi dinner for an enterprising egret, taking advantage of fish left behind by the previous night's new moon. The egret waits at the edge of the inlet, for all the world like a cat at a mouse hole. This is a common egret, also called a great egret. 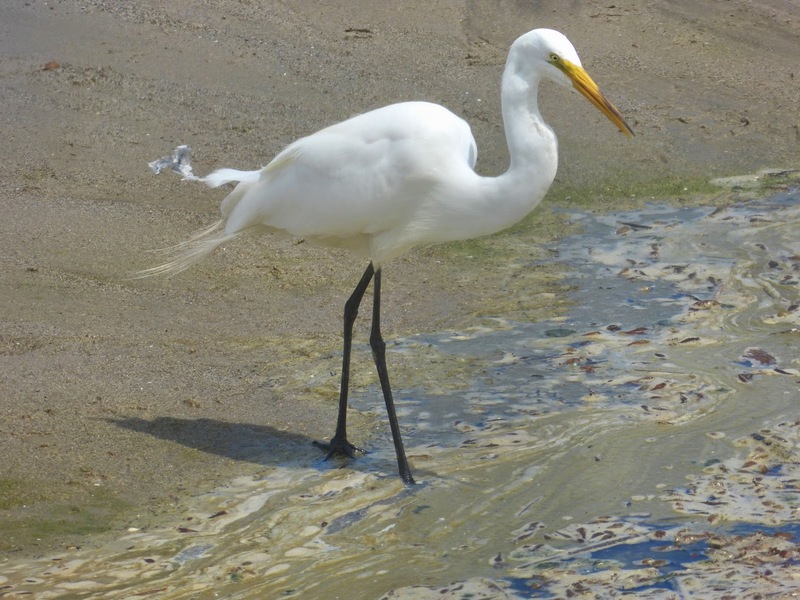 It has black feet—unlike its much smaller cousin the snowy egret, which has yellow feet. 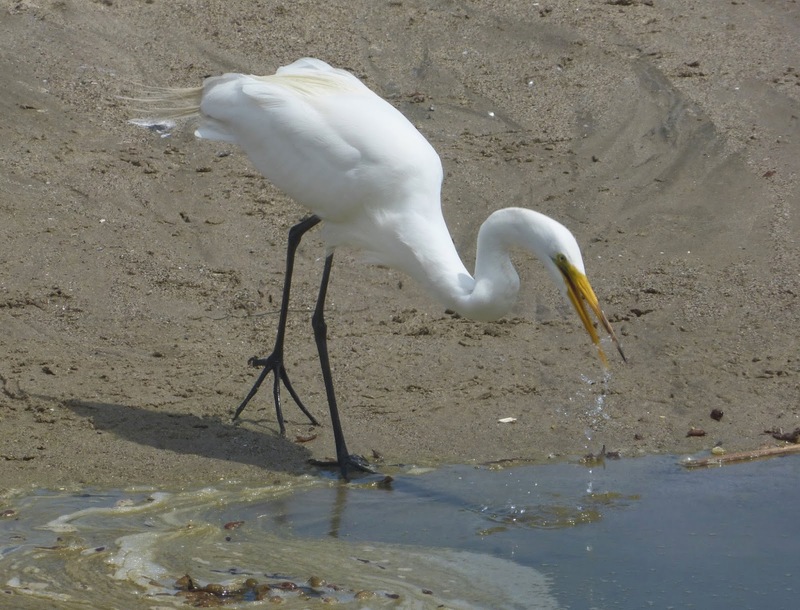 Great egrets stand more than three feet tall and can have a six-foot wing span. They are master fishers with good eyesight, boundless patience and lightning fast reflexes. Apparently the fish wasn't oriented for optimum swallowing. 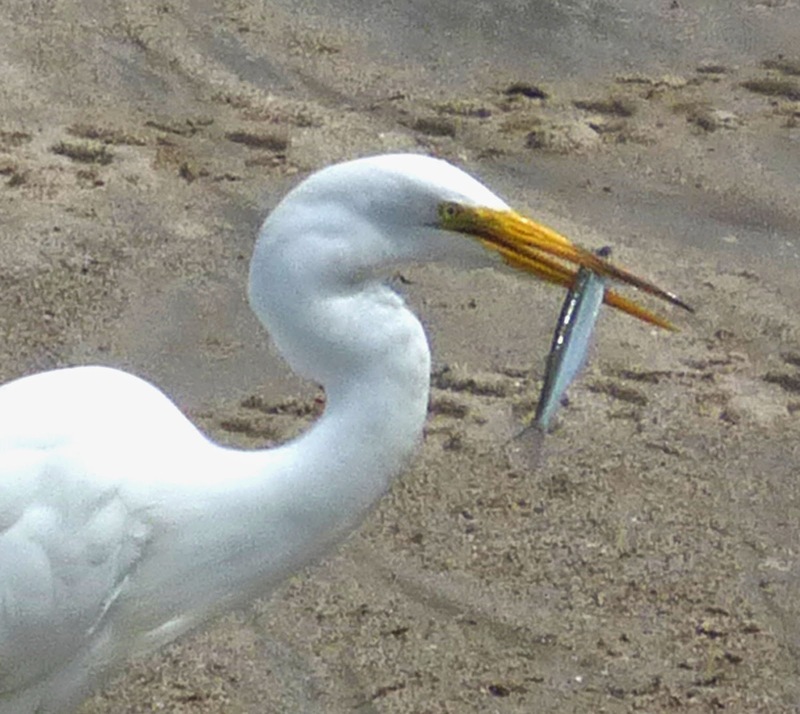 The egret carefully spit it out, caught it in mid-air, flipped it around and gulped in down head-first, all in about three seconds. However, that quick flash of silver was enough to attract the attention of a passing Caspian tern. "Grunion? I want a grunion." 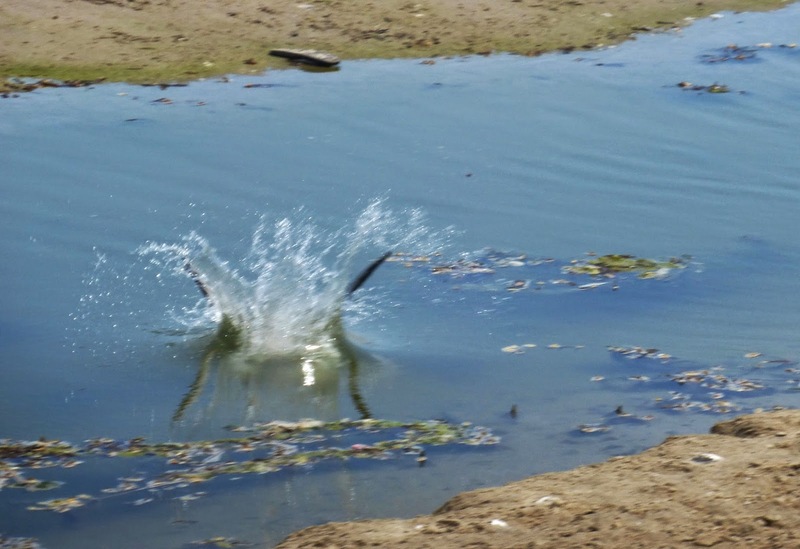 That water can't be more that a foot deep, but the tern spots a fish and dives for it. Splash! The most impressive part of the feat was how quickly the bird surfaced and transferred itself from the water back into the air. This fish was also swallowed head first, gulp! Within seconds the tern was back in the air searching for more grunion, diving into the shallow inlet, and emerging again and again with a succession of silvery fishes. I've described Surfrider and the lagoon in the past as a sort of Jurassic Park where humans have a chance to encounter the living descendants of the dinosaurs, but what struck me today was the evident intelligence of the birds I watched. I have no idea if anyone has ever attempted to evaluate the intelligence of the great egret—although the green heron, a member of the same family, has been documented using twigs, worms, and even bread crumbs cadged from humans as fish bait (you can watch a video of one fishing with crumbs here)—but their patience and speed are impressive, and this particular heron seemed to have figured out that if it put itself between the grunion and the end of the inlet it would have an all-you-can-eat fish dinner. 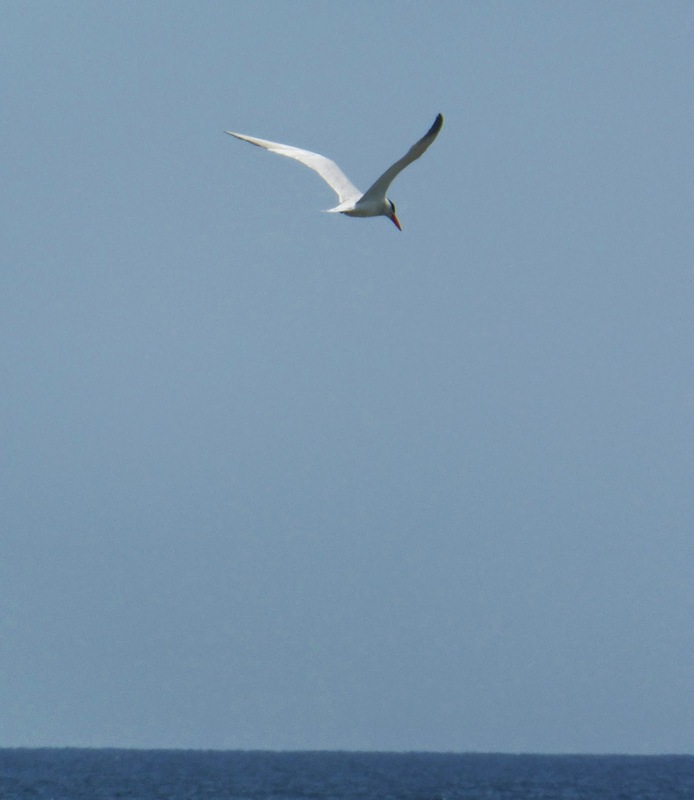 The tern and I both saw the egret at about the same time. Neither one of us could see what was in the water until we moved closer. 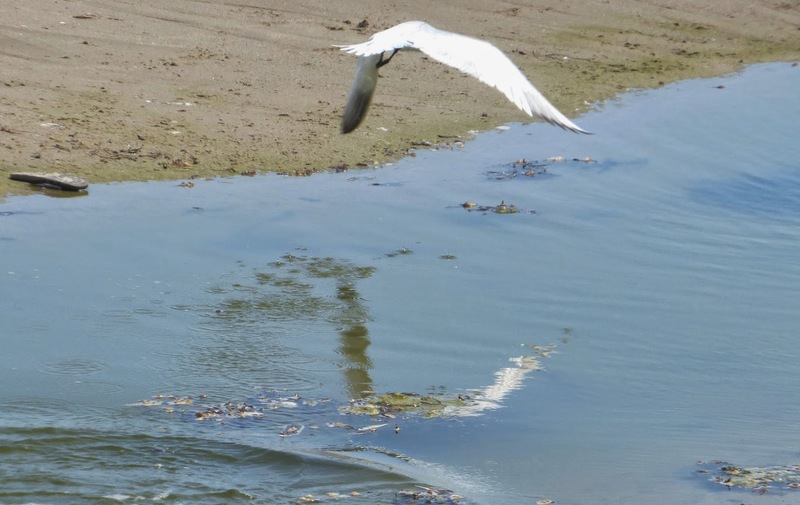 It appeared that the tern recognized that the egret was successfully hunting something and that it flew in to investigate, and instantly took advantage of the shooting-fish-in-a-barrel opportunity. It's easy to anthropomorphize, but they both seemed extremely well pleased with themselves, and with life in general. Alas, it wasn't a good time or place to be a grunion. The grunion run during the four nights following the new or full moon. Surfrider, Zuma and Leo Carrillo are good beaches to catch a sight of this fishy phenomenon, although there's no way of knowing if the fish will appear on any given night, even when all of the conditions appear to be right. Officials warn that bright lights and loud noises can scare the fish away—Flashlights should be used only to safely traverse the beach, not to illuminate the fish. It's a good idea to bring warm clothes and plenty of patience. 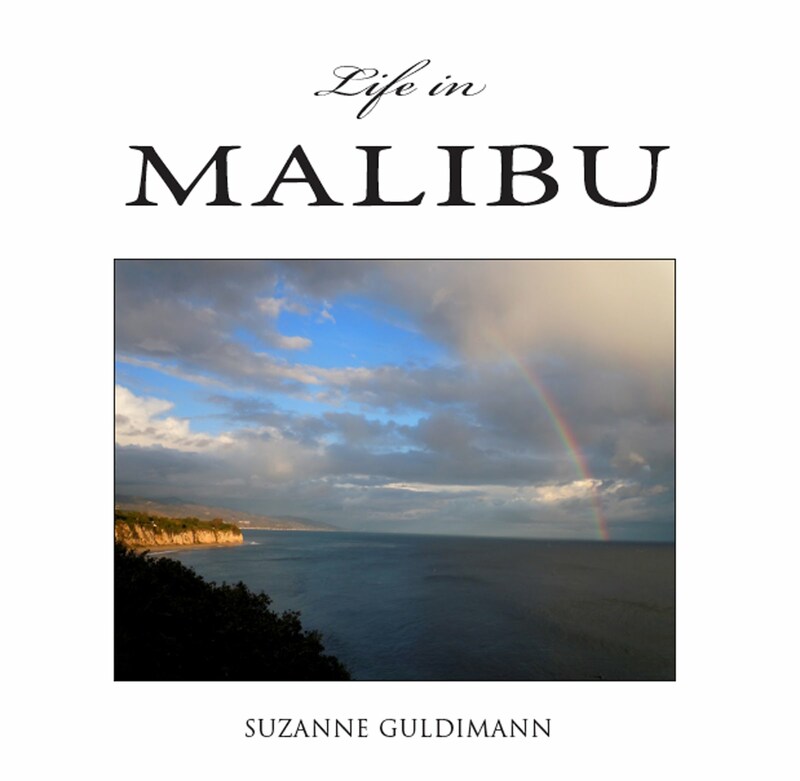 For anyone interested in addition grunion information, I wrote a more indepth article for the May 13 issue of the Malibu Surfside News. Dates and times and vast quantities of information on the 2014 grunion run are available at the California Department of Fish and Wildlife website. Most Hunter ceiling fans have a reverse option which is especially important to reduce heating bills in the winter, warm air can be directed down to where it is needed by spinning the ceiling fan clockwise.